Being faithful to my ideology of ‘Risk Management’ and not using the word ‘Revenue Assurance’– in this post I am trying to put my thoughts on the do’s for risk containment in operations implementing ‘Dynamic Discounting’. Let me try to put my thoughts around risk management in this issue. 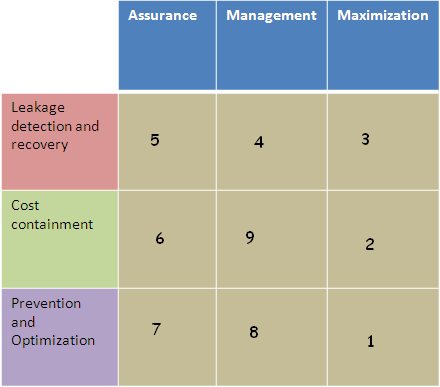 For the same, I would use the diagram of scope of work for risk management I tried putting together in another post. 4. last but surely not the least- increasing revenues. So in my opinion, this issue transcends across all the problem areas in the boxes of work. let me try and explain how to do risk containment in such scenarios keeping the ‘aim’ of DD in mind. 1. The key objective of DD is to achieve proper network utilization. This helps to understand how the cost of operations are being proportioned across the assets. However, what needs to be seen is how ‘cost effective’ DD is. 2. Assurance and Management of leakage and Prevention and Optimization: the first level of checks is to ensure that the discounts and offers configured are correct, and that the discounting that happens itself is correct. This is a classic case when a lot can be achieved with proactive and preventive methods. Configuration KPIs have thus a key role to play. Along with that- this is also a classic case when the conventional domains of “network assurance” and the “revenue assurance” merge. For network assurance, a large number of operators use Test Call Generators. This tool can help to play a pivotal role in aiding in proactive leakage discovery and fixing. These boxes can be used to generate calls in the network in varying proportions and then the rating engines can be used to rate/discount the calls as per the congestion information obtained from the network. The best part in doing so is that — even before the offers are rolled for public usage, the same can be tested with physical calls without affecting big time revenue. Revenue assurance tools that allow discounting verifications play an important role in verification of the configurations for discounting. Samples of data sets typically taken during both peak hours and off peak hours and then checked for rating and billing (discounting discrepancies) would be good enough to present problems that may be present in the network. However, the use of test call generators is more of a pro-active methods of stopping leakages. This is a situation, when silos needs to be broken and marketing and revenue assurance teams need to sit and work on solutions for preventing leakages. 3. Maximization– That there is a continuous check of network traffic, DD typically has the capability of improving the usage of existing network. An interesting trend in subscribers as noted in an article in TM Forum is “Subscribers are no longer churning over to the competition but keeping multiple prepaid subscriptions and topping up with the operator who is offering the best discount for that month“. Thus essentially there is a big potential of DD in reducing churn, if this trend is continued. MTN has been very successful with dynamic discounting. Maximization of resources would surely help to increase top-line revenues, especially if customers are not churning out. Another significant aspect that I can think of dynamic discounting could be the possible use of similar technologies as telecom operators go for consolidation of operations. I have tried to discuss the benefits of consolidation of telecoms in this post. Optimization of shared resources could be an important aspect of cost containment and improvement in top-line revenues. Dynamic discounting may be a method of achieving the same. This probably is too early to comment on the future benefits of Dynamic Discounting– however,RAFM teams really need to work with Marketing and also be extremely pro-active instead of trying to react to losses. Please do share your thoughts on the same! This entry was posted in Preventive RA, Proactive RA, Revenue Assurance, Revenue management, Risk Management, telecom, Test Event Generation. Bookmark the permalink. A peek at her patented thoughts!! Saving the world, one funnel at a time! "Everyone's entitled to my opinion"